Communications are vital in a complex defence structure such as the Atlanticwall. Cable bunkers provided the crossroads in the complex telephone network. You may find them in a row at a distance of approx 1 km behind the coast (Seefront) or likewise behind a Landfront. For the interconnection the occupants used the existing civil cable network, which was often expanded with newly laid German cables. If a crossroad of cables was nearby an other bunker, than this one would provide the function of cablebunker. We have one example in the section "Other". Many of the cablebunkers in the Atlantikwall remain. 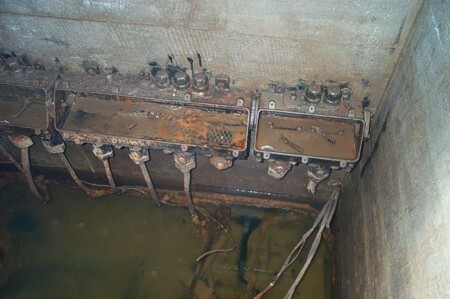 Groundcables were brought inside the bunkers and mounted on junction box. Here every cablepair was available on two connectors. So, as an example, cablepair 1 of cable A could be connected to cablepair 12 of cable D. In this way direct circuits from one location to an other were established. The Germans called the junction boxes "Kabel End Verschlüsse" (Kev). Kev's somewhere in the Atlanticwall.